DeFelsko manufactures various hand-held, non-destructive paint thickness gauges that are ideal for measuring coatings on wires. To non-destructively measure the thickness of non-magnetic coatings on wire and small diameter substrates. The PosiTector 6000 F Microprobe series consists of 3 gages which measure coatings up to 45 mils (1150 microns) thick, making them ideal for non-destructive measurement of most coatings on as low as 80 mil diameter (14 gauge) ferrous wires. For best results on small diameters, a quick release adaptor with a V-groove ensures optimal alignment, transforming the ferrous microprobe into a constant pressure probe. Repeatability may be further improved by mounting the microprobe in a probe fixture stand to ensure repeatable positioning of each part. 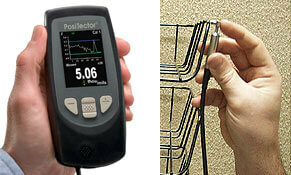 45 and 90 degree microprobes are also available for awkward or hard to reach measuring locations. Three PosiTector 6000 N Microprobes are designed for measurements on slightly larger diameter non ferrous (non steel) wires. The measurement process is simple. The instrument is zeroed on a bare wire, termed a calibration adjustment. Accurate and repeatable measurements can then be taken on coated parts with a similar substrate and diameter. To simplify the measurement process, applicable PosiTector 6000 models permanently store calibration adjustments, potentially one for every wire substrate and diameter. With as low as 1% accuracy and the potential for 0.01 mil (.5 micron) resolution, all probe types have excellent performance. 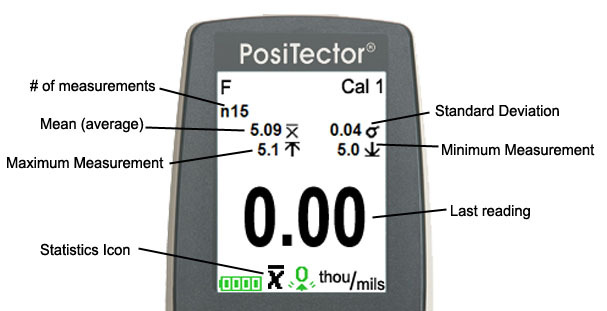 The Advanced models of the PosiTector 6000 (identified with a "3" in their model name) have several powerful features that are ideal for these types of measurement applications. For statistical process control, the instrument continually displays and updates the number of readings, average, standard deviation, minimum and maximum thickness reading while measuring. In addition, the HiLo feature enables high and low limits to be set providing an audible and visual alert to the operator when any measurement exceeds the specified limits. For record keeping, up to 100,000 readings can be stored in up to 1,000 different batches for future analysis and downloading. The PosiPen mechanical gauge provides a cost effective alternative with similar measurement capabilities, though it provides lower accuracy and resolution. An advantage of the PosiPen in particular is its ability to directly measure hot applications without damaging the probe. For current pricing or to order these instruments, please visit our Sales page. Most wire sold today has a protective coating to prevent wear, damage and corrosion. Some common wire coatings include chrome plating, porcelain, galvanizing, aluminum, epoxy, polyester, polyethylene, polyvinyl chloride and paint. Chrome plating of iron and steel rod cooking grills is mainly cosmetic while providing some protection from corrosion. They are often used as warming racks. Porcelain coating of iron and steel rod grills provides protection from food sticking and corrosion. The quality of the grill is directly related to the rod and porcelain coating thickness. Galvanizing is the primary coating for chain link fencing which is used extensively in tennis courts, stadiums, parks, industrial units or any premises requiring security. Chain Link fencing fabric comes in a variety of gauges, with a wire diameter ranging from 16 to 4 gauge (64 to 232 mils). The zinc is a self sacrificing element that slowly dissipates, protecting the steel from corrosion. Longevity of the protection is therefore directly related to the applied thickness. Chain Link Fencing quality is determined by the gauge of wire and the thickness and consistency of the galvanizing. Galvanized Wire netting is typically made from a low carbon 12-14 gauge wire. It is used as a reinforcement for the roof and floor of buildings, in partitions for walls, and as fencing for animal cages, kennels, fish gardens, lobster traps, gardening and playground security. Aluminum and aluminum alloys are also used as corrosion protection for steel chain link fencing. When applied with equal thickness, aluminum-coated wire may resist corrosion up to five times longer than galvanized. 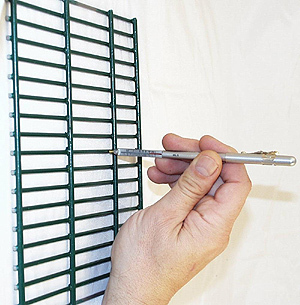 Epoxy coatings are frequently used to protect steel reinforcing bars, wire mesh and dowel bars. Applied through an electrostatic powder coating process, common specifications range from 7 to 12 mils (175 to 300 microns) of epoxy coating, with a minimum acceptable of 5 mils (125 microns). Polyesters such as nylon are powder coated onto wire goods such as dishwasher baskets, shopping carts and bicycle racks. Dishwasher Baskets may contain 10 to 25 mils ( 250 to 625 microns) of coating, where as bicycle racks may only require 6 to 8 mils (150 to 200 microns). Nylon coatings are popular due to their attractive appearance as their ability to provide protection from corrosion, washing and rinsing agents, moisture, wear, abrasion, stain and impact resistance. Polyethylene is a common thermoplastic type coating for refrigerator racks due to its corrosion prevention barrier. Polyethylene is recognized as safe for contact with foodstuffs, pharmaceuticals and drinking water. Features include consistent custom coloring, good impact strength, economical, high gloss, smooth surface, good durability & flexibility, good adhesion, single coat high thickness, ease & simplicity of coating, corrosion protection, and enhanced product appearance and feel. Thermoplastic coatings are also used on bike racks due to their high impact resistance (bicycle friendly) and UV stability when applied with a thickness of 8 to 12 mils (200-300 microns). Polyvinyl chloride (PVC) are powder coatings that balance properties including softness, rubbery feel and resistance. PVC powders generally exhibit outstanding impact resistance, chemical resistance, outdoor durability, color uniformity, and toughness. As a result PVC is often used in bicycle rack, dishwasher baskets and food contact applications such as refrigerator racks and freezer baskets. Aesthetically pleasing, extruded PVC coatings are often galvanized over 6 to 14 gauge galvanized fencing wire to provide additional environmental and corrosion protection. Extruded PVC coating is applied at a coating thickness of up to 25 mils (625 microns) over a galvanized core wire. Vinyl powder coatings produce uniform finishes with a thickness starting from 7 mils (175 microns) with a single application. Extruded PVC coating is a high strength galvanized steel chain link fence fabric for industrial, commercial, and institutional applications. Extruded fabric is contained in local, state and federal government specifications for use in prison, road, dock, airport, housing, forestry, and military use. Low lead and zinc paints are powder coated to large iron and stainless steel bird cages. Iron cages require full coverage and bond strength to prevent dangers of toxic poisoning from the flaking paint or iron cage. Despite the wide range of available coatings, a common shared element is that corrosion and protective coating applications typically have an allowable thickness range. Premature failures can occur if the thickness is either too thin or too thick. The process of coating small diameters (such as wires) has many variables to be controlled. Consider the powder coating process in which preheat temperature and time, dipping time, as well as post heat temperature and time all affect the eventual coating thickness. To adhere to applicable ASTM specifications, as well as in other applications requiring the control of coating quality and costs, it is necessary to monitor and control coating thickness variation. In addition, ASTM standards that call for stripping and weighing of coating can be quickly and less expensively spot inspected using a coating thickness gage.